Poll: Clinton Leads Trump, But How Would November Look Without Him? 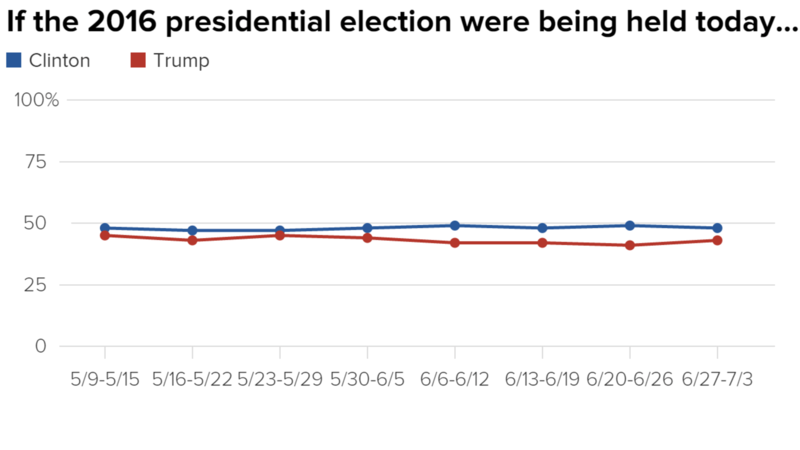 Hillary Clinton has a 5-point lead over Donald Trump — a slight dip from last week in her margin over the presumptive Republican nominee, according to data from our latest Weekly Election Tracking Poll. 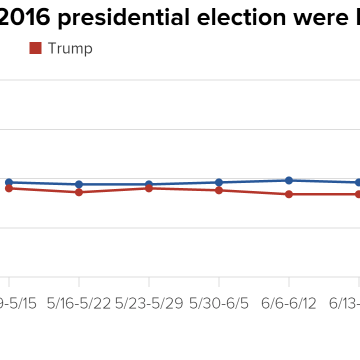 This week, Clinton enjoys 48 percent support of registered voters to Trump’s 43 percent. As the campaigns gear up for conventions later this month, there have been murmurings of a “Stop Trump” movement that would open the convention to the possibility of nominating another Republican candidate. Though Clinton has picked up momentum against Trump in the past few weeks, the general election in November looks different when we poll other Republican candidate alternatives against Clinton in hypothetical match-ups. Voters are split when Clinton is matched up against Mitt Romney. In a match-up against House Speaker Paul Ryan or Ohio Gov. John Kasich, Clinton falls behind. 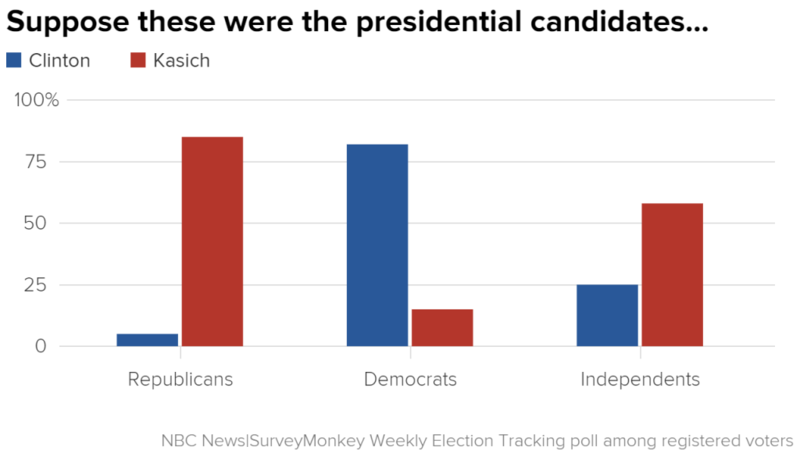 These results are according to the latest from the NBC News|SurveyMonkey Weekly Election Tracking Poll conducted online from June 27 to July 3. Clinton has a clear advantage over Trump (41 percent to 38 percent) when Libertarian candidate Gary Johnson and Green Party candidate Jill Stein are included as choices in an alternative version of the horserace question. One of the motivations of the “Stop Trump” movement is that other Republican alternatives are better general election candidates than Trump. Our hypothetical general election match-ups suggest that some Republican alternatives do, in fact, fare better than Trump against Clinton. 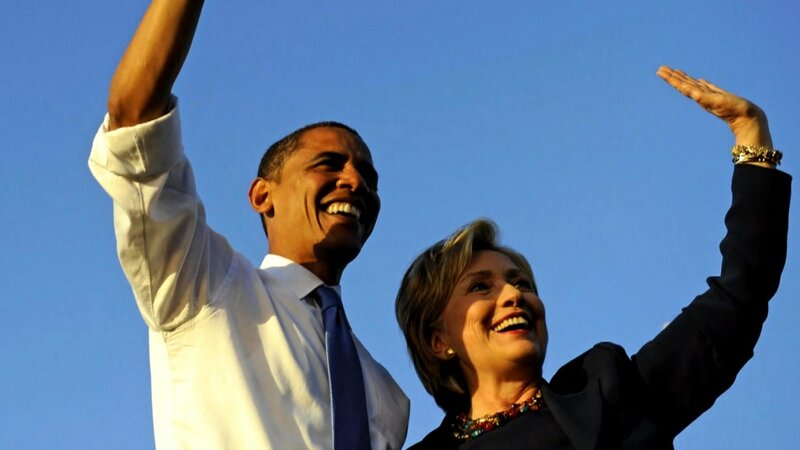 This week’s poll asked how Clinton would do against former Republican presidential nominee Mitt Romney, current House Speaker Paul Ryan and former presidential hopeful John Kasich. In the case of a Romney and Clinton match-up, voters are evenly split. Romney, an outspoken Trump dissenter, has publically denounced the GOP’s nominee in favor of a more presidential candidate. 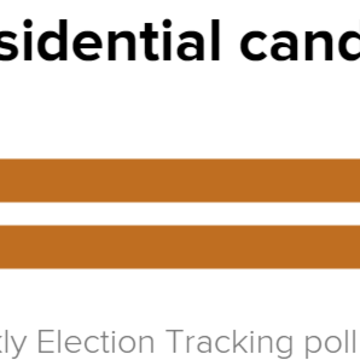 In a Clinton match-up against Ryan, the race is close, but Clinton is slightly behind. Though the House speaker has repeatedly said he has no interest in a White House bid, if the election were today and he were on the Republican ticket, Ryan would barely edge out the presumptive Democratic nominee by 2 points—47 percent to 45 percent. 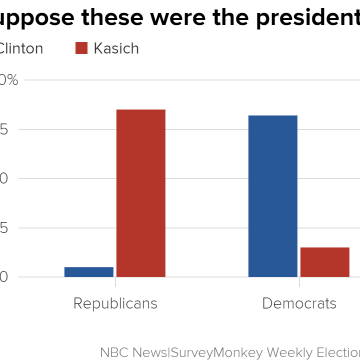 Perhaps most surprising are the results of a Clinton vs. Kasich November match-up. Though the Ohio governor was only able to secure enough support during the primaries to win his home state of Ohio, he leads Clinton by 8 points—the same margin as Clinton’s lead over Trump last week. Kasich’s large lead over Clinton is mostly due to the fact that he pulls in more Democrats and Independents than either Ryan or Romney—who pull in similar numbers of partisans. Though 9 percent of Democrats would go for either Ryan or Romney, Kasich pulls over 15 percent of Democrats. And while Independents are more tepid in their support of Romney or Ryan (roughly 52 percent), nearly six-in-10 Independents would swing toward the more moderate Republican candidate in a general election scenario. Though a move to nominate a Republican alternative to Trump does not seem to have enough support to actually happen, our recent polling data suggest other Republican alternatives do perform better than Trump against Clinton. This is somewhat unsurprising as hypothetical candidates usually do better than the actual candidates in polling match-ups and it is still very early in the general election contest. Nonetheless, the results provide an interesting glimpse into the strengths and weaknesses of Clinton and Trump across different electoral groups. The NBC News|SurveyMonkey Weekly Election Tracking poll was conducted online June 27 through July 3, 2016 among a national sample of 11,486 adults aged 18 and over including 10,072 who say they are registered to vote. Respondents for this non-probability survey were selected from the nearly three million people who take surveys on the SurveyMonkey platform each day. Results have an error estimate of plus or minus 1.3 percentage points. For full results and methodology, click here.